Identify how noise-reduction and safety-protection products can provide patients with quieter and more comfortable spaces to heal and health-care professionals with better work environments. Describe how design elements and products can absorb noise in health-care facilities, thus optimizing acoustics in health-care environments. Explain how materials and products provide health, safety, and welfare for patients and occupants by limiting debris from damaged walls and the transmission of germs, thus reducing the number of health-care-associated infections (HAIs). Discuss how specialty products enhance safety for specific populations or populations with specific needs. Understand how materials and products are specified for germ reduction, noise reduction, and wall and door protection while also providing environmental solutions. Room acoustics, privacy, and patient safety are vital to ensuring that patients are able to get the rest they need to heal. Noise-reduction and safety-protection products can improve the health, safety, and welfare of patients as well as hospital staff. They also provide patients with the comfort needed to rest and heal. This hospital room features products specified to improve the patient experience and promote health, safety, and welfare. Walls, doors, and ceilings are part of every hospital. By selecting superior products, each of these building components has the potential to improve the patient experience and also provide a better working environment for the hospital staff. 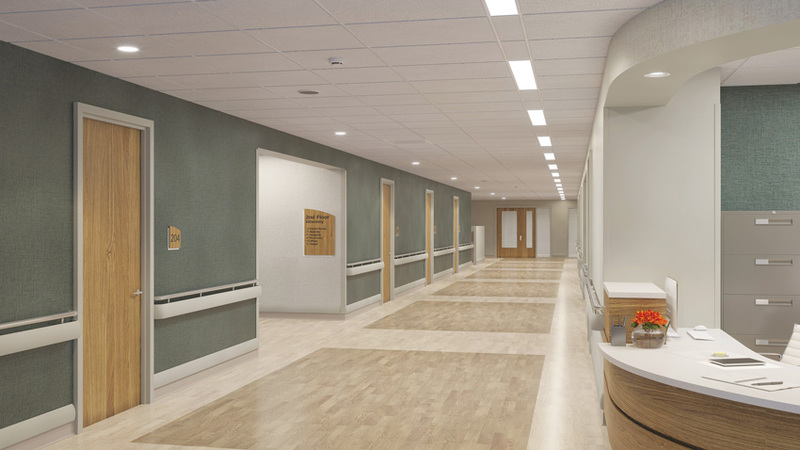 Inside the building, other products can be added to walls, doors, ceilings, floors, and spaces throughout the hospital to improve patient comfort and safety. These products include cubicle curtains and tracks, both of which provide safety and comfort for occupants, as well as ligature-resistant and bariatric handrails that offer safety to specific groups of patients. Walls make up one of the largest elements of an interior. In addition to creating spaces within the interior, walls also can help reduce the transmission of sound and provide aesthetically pleasing spaces through the use of bright colors or graphics. However, if walls are damaged or dingy, they can create negative impressions or even anxiety for patients who come to the facility to heal. Specifying quality wall materials and wall protection can not only protect the walls but also create a more positive environment for patients. Wall panels made from long-lasting materials that quickly lock into place allow for easy installation. These panels can be installed by one person in almost half the time when compared to traditional z-clip systems. Because they are easily installed, they can also be easily removed for repairs. Panels that snap into place can be butted up to each other and installed almost flush with the ceiling. To further increase the durability and life of walls, wall protection can be added to walls and is recommended especially for high-traffic areas. Wall protection often comes in the form of rigid plastic sheets and is available in a range of colors and patterns. While rigid plastic is extra durable, there are other alternatives available for those in search of a different aesthetic. A new class of flexible wall-protection materials is now available and has changed the look of wall coverings without sacrificing quality and function. These new materials incorporate intentional textures and are as durable as rigid plastic. They can also fend off stains and marks and be installed seamlessly, providing a professional appearance. 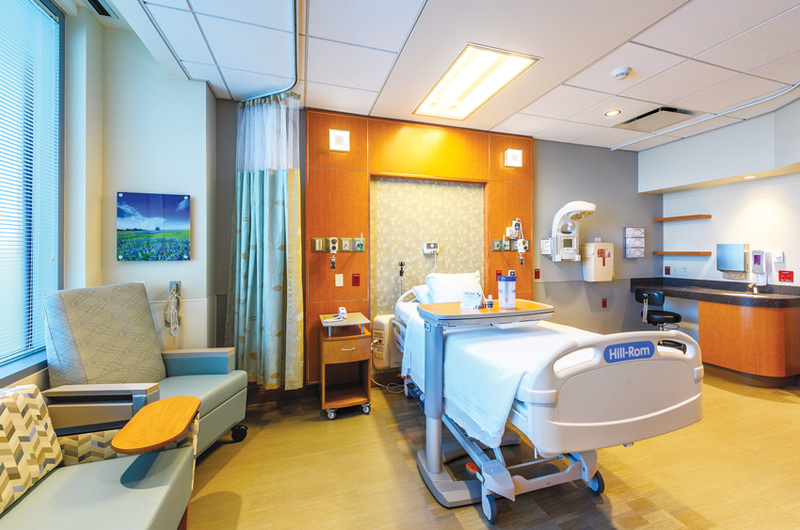 Durable wall products installed in hospital settings reduce the damage caused by carts, wheelchairs, and beds. Doors are another interior element prevalent in hospitals. While doors are common in most buildings, not all doors are the same quality or designed to handle the level of use that hospital doors can see. In high-traffic areas, such as between waiting rooms and treatment rooms, doors are constantly being opened and closed as well as bumped by machinery, carts, and possibly wheelchairs or gurneys. Doors can also separate public spaces such as hallways from sterile spaces like clean rooms, labs, and operating rooms. When specifying doors, it is important to understand the various types of doors as well as the amount of use the door is likely to receive in a specific area. In high-traffic areas, it is important to select durable materials that can be quickly and efficiently repaired and easily cleaned. 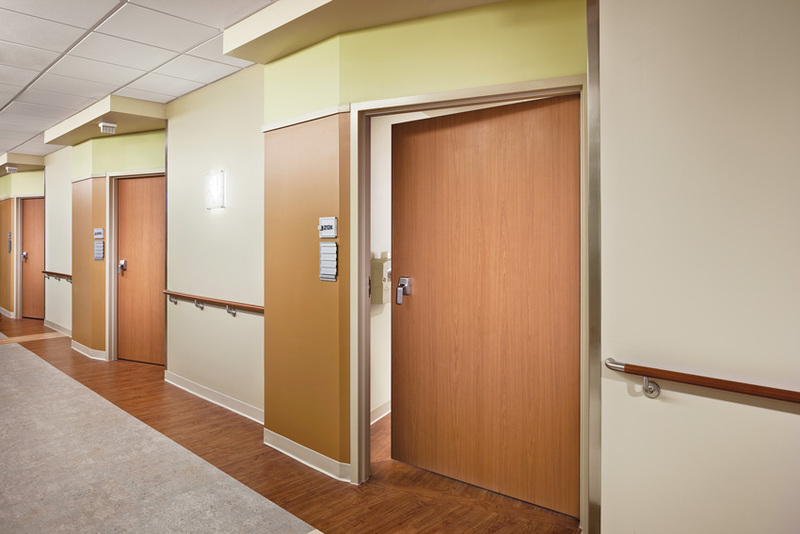 Doors made from materials resistant to germs and bacteria are ideal in health-care facilities where germ transmission is likely and occupants are already compromised. Durable door and doorway materials can reduce wear and tear and also provide environmental benefits and cost savings. In health-care environments, interior elements have to fulfill many functions, and multiple goals must be balanced. Kristin Ledit, IIDA, senior vice president and director of interiors at FKP Architects, explains the factors that drove the selection of interior doors for the Nemours/Alfred I. duPont Hospital for Children in Wilmington, Delaware. Durable door materials reduce the risk of unsightly damage and costly repairs. Ceilings are a necessary part of construction that also provide protection to occupants and can affect air quality. Design elements that go into ceilings can add extra protection and also reduce noise. Many buildings, including health-care facilities, are not acoustically optimized for their intended purpose. A wall-to-wall ceiling is most often the most efficient solution, but in some cases, this is not achievable. There are three product families that can support aesthetic design, technical challenges, and construction-based limitations all while achieving improved sound environments. These include free-hanging clouds and baffles, direct-to-deck panels, and wall panels. Cubicle curtains can divide large spaces into smaller enclosures in areas where multiple patients are being treated. The curtains provide a private enclosure for patients. Cubicle curtain design has evolved in recent years. The opening and closing of older cubicle curtain products creates noise that can disturb patients trying to rest. Innovations such as bendable cubicle tracks and smooth-glide designs allow for quiet movement of carriers along the track. This can lower the decibel level when compared to traditional track products. Newer designs made from easily laundered materials also help reduce the occurrence of health-care-associated infections (HAIs) by providing separations between patients. Frequent cleaning and laundering can prevent the spread of germs and bacteria. In-patient suicides and self-harm are serious issues in health-care facilities that focus on behavioral health. Hanging is the most common method of suicide and requires the use of a ligature, which is an item used to bind one thing to something else. Ligature-resistant products are commonly used in both behavioral health-care facilities and facilities accessed by the general public. Ligature-resistant products help prevent self-inflicted harm by preventing patients from binding themselves to a structure (for example, for the purpose of hanging themselves) or hurting themselves on sharp corners or edges. Patient falls are one of the most common dangers in health-care environments. Handrails can reduce the risk of falling by providing support and helping patients maintain balance; however, these handrails must at times accommodate patients who are obese, also referred to as bariatric patients. Products such as bariatric brackets can reinforce handrails to accommodate more weight, providing increased safety for patients and occupants. Noise is inevitable in busy places like hospitals and health-care facilities. In addition to being a nuisance, noise causes fractured sleep and slower healing for patients while also causing stress and distractions for health-care personnel. For patients, good acoustic environments can lower blood pressure, improve quality of sleep, and reduce the intake of pain medication. Healthy acoustic levels also lower stress and improve communication, which is vital when a doctor is relaying health information to a patient. They also improve patient safety while enhancing staff well-being, which leads to better job performance and higher job satisfaction. With all of the technological advancements in 21st century hospitals and machinery, combined with the considerable foot traffic from doctors, medical practitioners, patients, and visitors, there is significant potential for harmful noise that not only prevents patients from resting but also can cause hospital staff fatigue. Hospital staff fatigue can lead to burnout and even mistakes. There are many manmade and machine noises in hospitals, such as device alarms, overhead paging and intercom systems, and even conversations between hospital staff in the corridors. While all these things that create noise are vital to hospital operations and patient care, the noise can prove to be harmful to patients and hospital staff. Noise can be mitigated and reduced through design. High-quality products and materials that go into the construction of floors, walls, curtains, and doors can significantly reduce sounds, thus improving health, safety, and welfare of both patients and staff. Sound-absorbing products not only benefit patients who need quiet spaces to sleep, but they also allow doctors and patients to communicate without excess background noise. A quieter environment makes it easier for health-care professionals to think clearly while making life-or-death decisions. Symphony® m is a mineral fiber panel that provides excellent sound absorption and blocking plus washability with a superior finish and exceptional durability. For demanding health-care applications, Symphony m Rx offers additional stain resistance and water repellency. Part of the Symphony Collection, a series of smooth ceilings with design flexibility, Symphony m can be combined with Symphony, Adagio®, and Tufcore™ to provide matching visuals with differing acoustic performance within the same space. This curtain system eliminates the dangers of removing cubicle curtains from ceiling-mounted track systems. Instead of getting on a ladder to remove the privacy curtain, Snap Lock allows maintenance staff to separate the fabric portion of the curtain from the mesh while standing on the ground. Soiled curtains are then laundered, and the maintenance staff snaps clean curtains back onto the mesh. With endless images to choose from and various sizes and mounting options to work with, Printed Wall Art will add personality to your walls. Inpro is excited to announce a new partnership with Larry Emerson and his firm The Art Around You. This partnership expands your access to a wide range of images to complete the decor in any space.